With so many modern conveniences at our disposal, we often overlook technologies of the past in lieu of something newer, something advanced. Such is the case with transporting goods and products in the United States. Truck transportation is viewed as the current reality of delivery and freight networks are often looked at as something of the past. But while motor vehicles continue to evolve and become more energy efficient, they can only be so effective, since there are so many drivers on the road with more and more joining them each day. And trucks are a significant percentage of these vehicles on the road, constantly delivering goods and products to their intended destinations. The U.S. freight rail network, however, is generally considered one of the most dynamic freight systems in the world. It’s a $60-billion-dollar-a year industry that consists of 140,000 rail miles operated by seven Class I railroads, which are railroads with consistent revenues of $433.2 million or more. And the benefits of utilizing the freight systems aren’t just specific to big or small businesses; there are numerous public benefits including the decrease in road congestion, highway fatalities, fuel consumptions, logistics costs, and public substructure maintenance costs. The railroads themselves are considered to be a private organization, which means that they are responsible for the maintenance and improvement of the railways. This could mean some added costs for you, but regarding the revenue that they bring in, it seems to balance itself out over time. In comparison with other chief industries, they invest one of the highest percentages of revenues to maintain and add capacity to their system. That might sound a little frightening in terms of your bottom line, but the fact that maintenance and improvements are being examined on a consistent basis could mean continuously faster delivery of your products, which will make customers very happy. Another plus with the railway is that almost anything can be shipped by rail. While trucks can be a good solution for goods traveling short distances, the farther a product needs to travel, the more a railway makes sense. With railways, there is a potential for limited stops, meaning your products could reach their destination in a much shorter amount of time. This is especially beneficial for companies that are shipping raw goods or foods that have a small timeframe in which they need to be delivered and sold. Rail transportation requires a very small space of consumption necessary to transport goods. Additionally, rail terminals have a habit of being centrally located and accessible to numerous areas, which can increase business and bolster revenue. Furthermore, railways are extremely economical in that they cost more initially, but the fuel needed to run the rails allows for farther distances to be covered. The preliminary costs of building railways are higher due to the construction of rail tracks and the provision of rolling stock, which can be expensive. These expenses are usually made before any revenue has been brought in and represents important entry barriers, which can limit the number of operators. 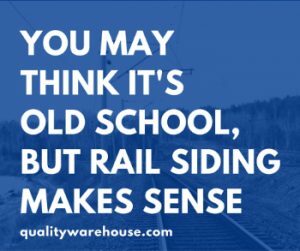 Rail rolling stock has a service life of at least 20 years, which is a much larger shelf life over a regular vehicle. This can also be an advantage since the rolling stock is more durable. Operation costs may seem high, but the benefits can truly outweigh the initial cost.